TDF 2010 Stage 16 Revisited: Where's Ulrich? 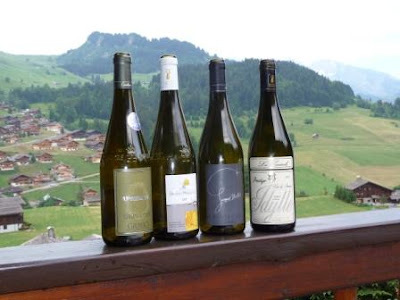 Owner of Wine Travel Guides, wine writer Wink Lorch lives part-time in a chalet in Chinaillon-Le Grand Bornand in Haute Savoie, just off the Tour de France route down from the Col de la Colombière. In summer the self-contained apartment in her chalet is available for short-term or weekly holiday rentals, or if you fancy a whole ski season in the Alps, in the winter it’s available on a seasonal basis. Most if not all of the photos in today's post come to us courtesy of Wink's partner, Brett Jones, who blogs as Brett the Wine Maestro. Today’s mountain stage goes through Savoie, this year marking the 150th anniversary of its ‘attachment’ to France, following a plebiscite in April 1860. The stage starts in the ski resort of Morzine/Avoriaz in the department of Haute Savoie and crosses over into the department of Savoie at the Col des Aravis above La Clusaz. As far as food and wine goes, the theme is cheese, cheese and more cheese, but a little wine too. 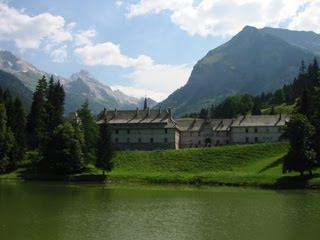 The narrow road up to the Col de la Colombière goes through the sleepy village of Le Reposoir below the Aravis chain of mountains, home to an impressive Chartreuse, now occupied by a Carmelite order. I’ve never knowingly eaten one of the large pike that live in the lake in front of the magnificent building, but they must sell them somewhere. It’s after Le Reposoir that the really steep climb up to the Col starts and it’s also the beginning of the real ‘Pays du Reblochon’ – Reblochon cheese country. The so-called berceau (cradle) of Reblochon is in the Aravis mountains, in the villages of Le Grand Bornand (a slightly stronger claim to be the first to have made it) and La Clusaz, both successful winter ski resorts. Le Grand Bornand has a population of around 2,000 people and a slightly higher population of cows (one of the highest for a village of this size in France). To attract summer tourists it styles itself as Capitale de l’Art Vache (The Cow Art Capital) and since a big festival in 2,000 when over 2,000 model cows appeared all over the village, it is full of cow art and sculptures. An appellation controllé cheese since 1958 (one of only 48 cheeses), Reblochon is made mainly in Haute Savoie with a small part of Savoie, from the milk of three breeds of cows – Abondance being the principal one. The milk must be unpasteurized. 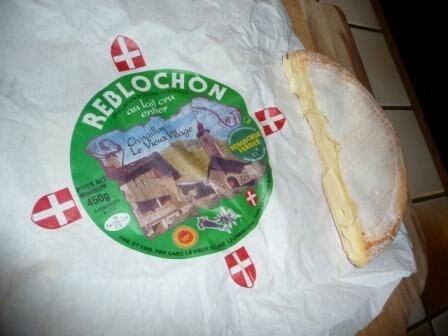 The best Reblochon made at individual farms has a Fermier designation, shown by a green casein stamp on the skin – a cheese like this sells for around 6 euros direct from my local village farm in Chinaillon-Le Grand Bornand (eat your heart out if you buy it in a shop in New York or London). The cheese is only around 450 grams (a pound in weight) with a yellowish skin and is usually matured before sale for just 3 – 4 weeks. Because of this, in summer when the cows eat grass and flowers rather than hay, the cheese is richer, creamier and nuttier than in winter. In winter it is best eaten in cooked dishes such as Tartiflette - an invented recipe from the 1950s made to appeal to winter tourists - consisting usually of lardons (bacon pieces), onions, potatoes, crème fraiche with Reblochon on top, baked in the oven. The traditional Aravis dish that Tartiflette is based on is named Péla from the Savoyard patois for frying pan – it consists usually simply of potatoes, onions and Reblochon cooked on the stove. Suffice it to say that this is a cheese that melts well, so can be used for a myriad of inventive dishes. On the evening before the Tour, we enjoyed a sublime match with Reblochon from our local farm, a Marestel, Roussette de Savoie 2007 from Edmond Jacquin et Fils from the Altesse grape variety – with floral and yellow fruit aromas and a very slight sweetness on the palate, it worked a treat. White is definitely best for Reblochon. With cooked Reblochon dishes, I prefer to match with the lighter wines from the Jacquère grape such as Apremont, Chignin or Jongieux. Once the Tour passes into Savoie down from the Col des Aravis and up again and over the Col des Saisies, we are in the Beaufortain area, home to the majestic Beaufort cheese which can be produced in a large area of Savoie, the length of the rest of today’s stage to the finish at St-Jean-de-Maurienne. 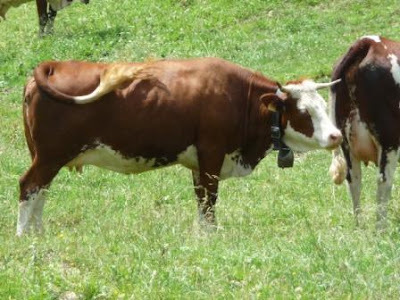 AOC since 1968, it is made from the milk of Abondance cows together with the smaller Tarine breed. This huge wheel of hard cheese, weighing 20-70kg (45-154 pounds) is made in a Gruyère style and must be matured for minimum 5 months; from milk produced in June – October the even tastier version is designated as Beaufort d’Été (summer Beaufort). It has a lovely, smooth texture and nutty, sometimes savory taste – there are plenty of recipes for cooking with it, but on a cheeseboard it is a treat. I enjoy it with the dryer, even occasionally lightly oaked Roussette de Savoie wines from the Combe de Savoie between Chambéry and Albertville. Locally, they suggest a red, but I don’t think a Mondeuse works at all well; a Savoie Gamay (particularly good in 2009) is better. 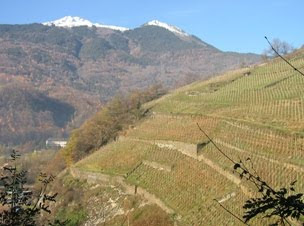 The closest vineyards to today’s stage were, firstly in the tiny Savoie cru of Ayze in Haute Savoie, around 15km to the west of Cluses where they passed through before the climb to the Col de la Colombière. It’s actually my closest vineyard, but these days there is only one good producer flying the flag with the local Gringet grape – namely, Domaine Belluard. Their fantastic dry, aromatic Le Feu, only made in top years is really excellent, and the standard Gringet is well worth trying too. They make exemplary sparkling Ayze too. These wines are hard to get hold of wherever you are, though a little is exported to the USA and the UK. Down from the Col de Saisies, the riders went through Albertville, home to the Winter Olympics of 1992. 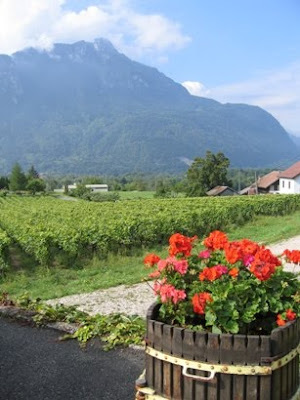 Just over 20km to the west begins one of the most planted vineyard areas of the scattered Savoie wine region on the southern slopes of the Bauges mountains stretching towards Chambéry in the valley known as the Combe de Savoie. Here you will find the villages of Fréterive, St-Jean-de-la-Porte, St-Pierre d’Albigny, Cruet, Arbin, Montmélian and eventually Chignin. This valley produces the best Mondeuse, and potentially good whites too, especially once you reach Chignin, growing Roussanne (called Bergeron here) as well as Altesse and the ubiquitous Jacquère. However, I doubt many people, least of all the Tour competitors realized that they were actually going right past a vineyard village today on the sprint, that of Cevins. Home to Domaine des Ardoisières, the domaine consists of a spectacular, steep vineyard slope above the village that having fell into decline after phylloxera and then complete disuse after the 2nd World War, was revived by a huge effort to unite no less than 400 landowners for an area of less than 10 hectares (25 acres). The effort was spearheaded by Michel Grisard of Domaine Prieuré St-Christophe in Frétervie, who was later joined by young vigneron Brice Omont, who today runs the estate. 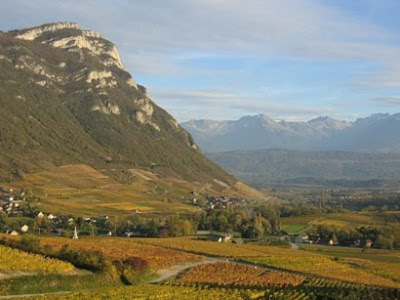 Run along biodynamic lines the wines are sold as Vin de Pays des Allobrogies and are all from local Savoie varieties. The first vintage was 2003, though with tiny quantities, and the quality has gone from strength to strength particularly with the two dry whites – Schiste (around 2/3rds Jacquère and the rest a myriad of varieties) and Quartz from 100% Altesse. So, Stage 9 was won by a Frenchman with two further Frenchmen in the top 10 list – will they indulge in some great Savoie cheese and wine tonight, I wonder?